Order Your Lego® Compatible Figure Showcase Today! If you have been searching for a way to show off your collection of interlocking brick characters (think Lego® minifigures), then look no further! This display case is the ultimate solution for your display needs. The Figure Showcase holds up to 132 of your treasured mini-figures! Don’t toss them into a drawer. Stop stepping on them on the floor. 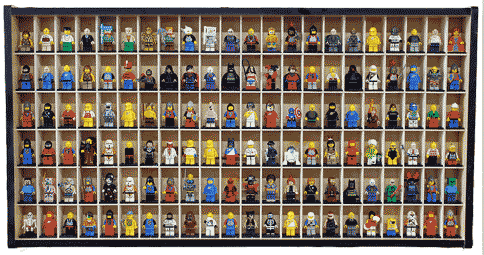 This display helps you organize your collection of old and new brick characters. Individual mounts are available for the Figure Showcase. 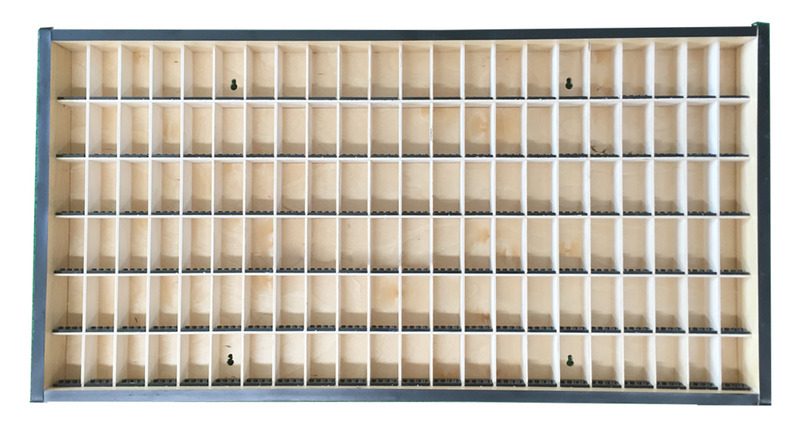 The shadow box design makes storage and displaying your figures fun and manageable. Precision CNC machined Figure Showcase measures 32.5″ wide x 16.5″ tall x 2.25″ deep. The space for each figure measures 2 3/8″ tall x 1 5/16″ wide. 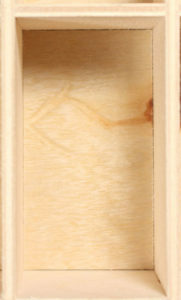 Each case is carefully constructed of 1/4″ and 1/2″ UV coated birch and trimmed with commercial t-molding. 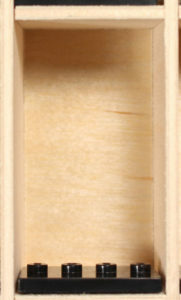 1/8” birch dividers separate each space. Some assembly required. Lego® compatible mounting bases optional. Designed by Larscraft. Made in the USA. *Bricks and toys are not included with purchase. Legos are passed down from generation to generation, and so too is the Makers Chest. Nothing beats precision tongue and groove construction. 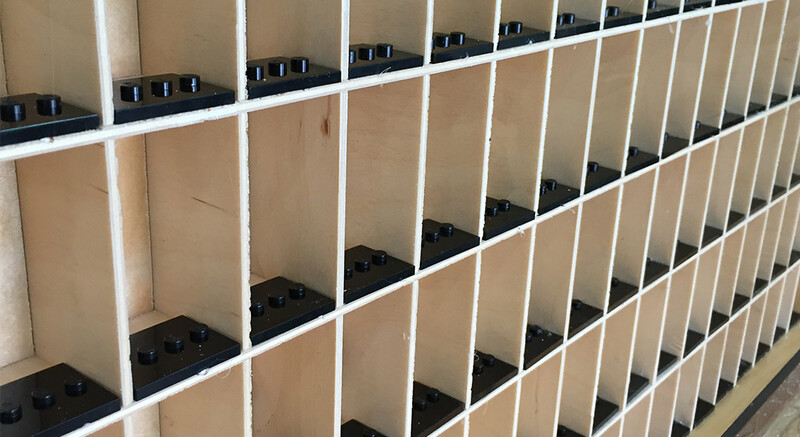 Each chest part is machined for a tight friction fit and we use only the best adhesives. Also noteworth is the industrial T-molded edge banding that will not peel or crack over time and is designed to take abuse from any angle. 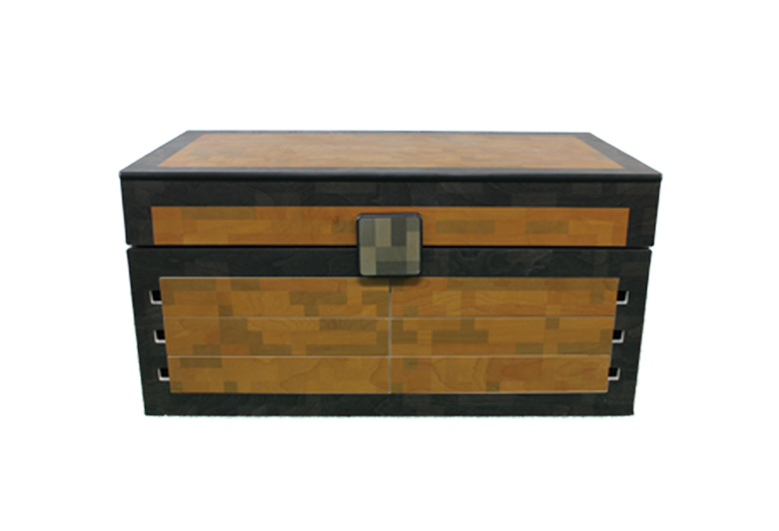 Quality USA construction means the Makers Chest will be a part of your family for decades. We use only the best quality woods that are not available through mass merchant retail chains. There is no particle board or mdf with laminate here. All this means is that you can kick it, stand on it, beat it up and it will never fall apart, and it’s built right here in the USA by our family business! Each chest features 6 removable trays that can be laid out on the floor for sorting and selecting a Maker’s desired parts. Each tray features two removable dividers that allow further part or toy separation. The trays are finely detailed with graphics on the front and remove with a clever finger slot instead of an unsightly pull handle. Two gas lifters are activated by turning a clever magnetic latch. This opens the lid and keeps it upright during play, so no need to worry about slammed fingers. The platform about the storage trays is approximately 18” x 36” of buildable space where Makers can play and store their creations. The woodgrain is quite beautiful and permanently captured by the protective UV coating on all of the parts, including the interior. The unique voxel artwork on the chest is acheived using a time intensive UV digital printer that essentially stains the wood. 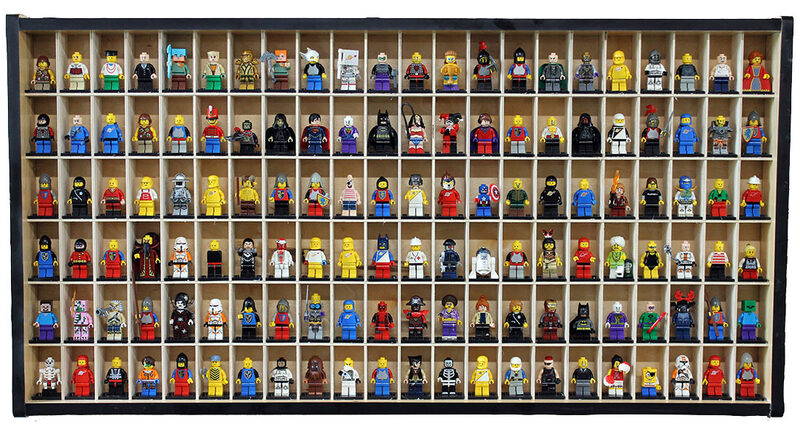 Makers with an extensive collection of Minifigures will appreciate the Figure Showcase, which holds up to 132 figures. The showcase conveniently attaches to the underside of the chest lid or can standalone and hang on a wall. Have more than 132 figures? No problem as the showcase is available as a separate item! Sold with and without Lego compatible bases. With a slight touch, the magnetic latch pivots to release the pistons that slowly raise the lid of the Maker’s Chest. 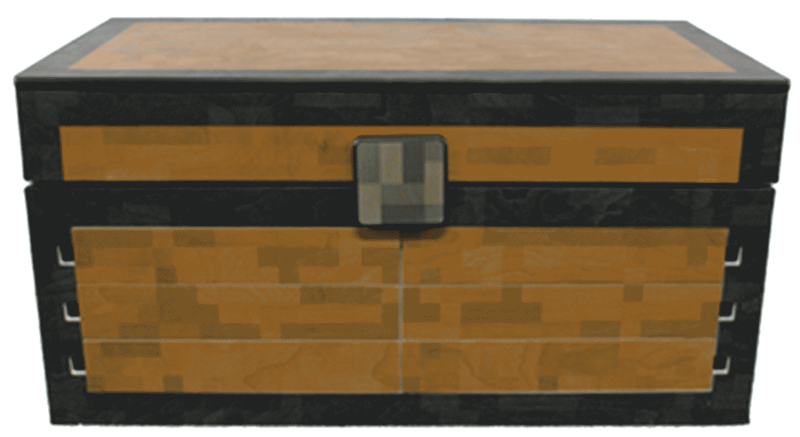 The sound and feel that is created from opening the Maker’s Chest is very similar to that of a chest in Minecraft the game. Order the Maker’s Chest Now!